Pedestrian barricades serve as multi-purpose barriers their most common use cases are for crowd control and establishing perimeters for transportation purposes. Other typical applications include outdoor events, parking garages, construction zones and even pedestrian walkway protection. 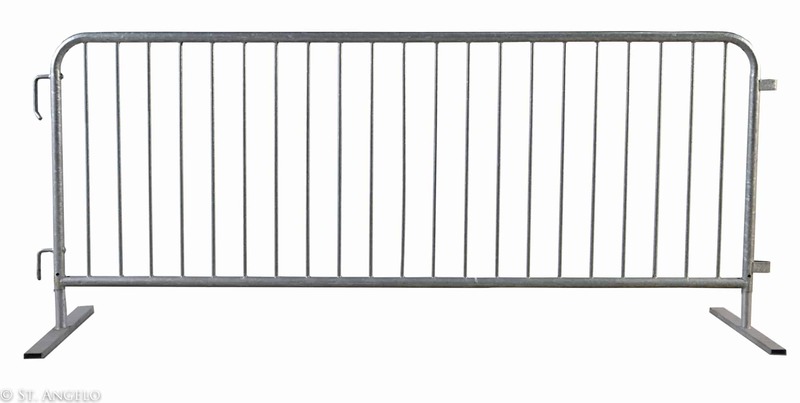 Crowd control and pedestrian barricades can be used in any environment, indoors or outdoors. All of our barricades come with interlocking connection points on both sides capable of creating a continuous link, so these barriers will deter the public from restricted areas and keep pedestrian foot traffic organized. Reflective tape, or customized canvas covers can be applied to steel pedestrian barricades to make it more visible and attractive – a great addition to its durable design. Using the correct setup with pedestrian barricades a high visibility can be achieved for crowd control. There can be situations when you need to let people or objects through your barricade, it’s good to have barricade swing gates set up at various points on your barricade line. The design of our pedestrian barricades allows them to interlock, making them capable of forming a continuous wall. Various configurations are possible in order to create separate, even VIP spaces, guide pedestrians and delineate restricted areas. When bolted together additional stability and security can be achieved. With our barricades advertising and direct messaging is possible, when adding signage to them. Clients can generate additional revenue by selling these spaces at their events. You have to make sure print graphics can stand up to weather just as well as our crowd barricades do. Crowd control barriers are easy to stack flat for easy storage and efficient transport. Each barricade can be carried by personnel to and from work zones. To sum it all up, our durable, resistant pedestrian barricades come with an easy-to-use interlocking hook system, so you can create a continuous barrier of any length. They are great for crowd control at races, concerts, carnivals, or any special event involving pedestrians. As a full-service company, we can help you plan out and determine how many steel pedestrian barricades you need, as well as deliver and set them up for you. For more information or to get a free quote, please contact us. Crowd control barricades are great for special events. Made of thick 16-gauge tubing, hot dip galvanized to prevent corrosion. Welded hooks ensure a positive interlocking of barricades. Bridge and flat foot available.